This 7 inch Figure of the classic 70's Tsuburaya Hero Fireman is scheduled to be released at the next Superfestival in January. The Inspire company continues to release these classic Tokusatu heros in the size I like to call the Bandai Modern Standard. Every since the King Zaurus series by Popy in the late 1970's pioneered this form factor, this style of figure has become the standard issue for the entire line of Ultra Heros and Kamen Riders alike. While the mainstream heros and monsters of the Ultraman and Kamen Rider franchises are continuously mass produced in China by Bandai and sold for 600 - 900 yen in stores all over Japan by the thousands, and a few of the classic Toei heros such as Inazuman and Barom One have been released; there are alot of older classic 1970's Tsuburaya heroes that have never been done in this Modern Standard style. Sensing a gap that needs to be filled is often the purview of many small Independent Japanese Vinyl companies, and Inspire has been filling this gap. And while its sometimes to hard to justify the disconnect of a form factor that match mass market figures that sell for less than 10 bucks and the price tags one associates with indie vinyl - these figures retail for over $40, Inspire definitely delivers on what is sets out to do. 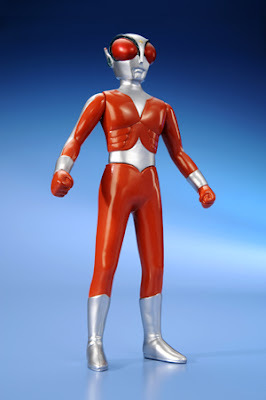 So far they have released quality figures of classic heroes Mirror Man, Silver Kamen, Spectre Man, Gambaron and many other obscure characters from the deep pantheon of Japanese Heros.